The flowering bush and brilliant rock in the foreground set above a winding river with a rolling horizon are Horace Sykes motifs, and the West's as well. 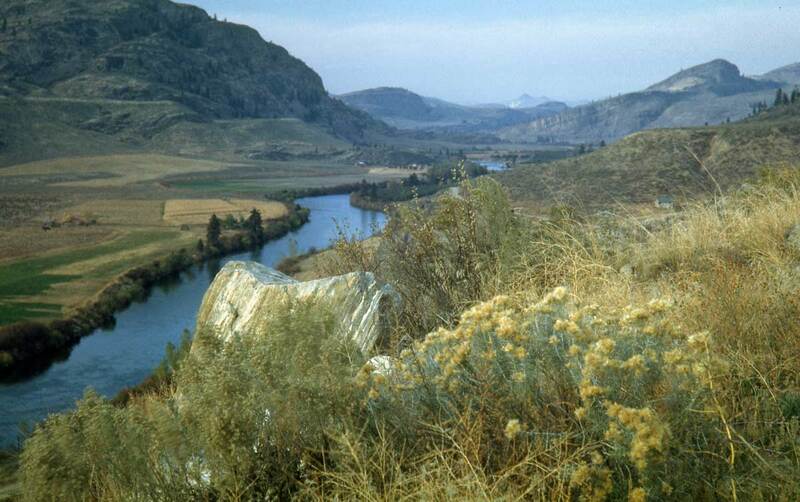 Again, Sykes neither captioned nor labeled this Kodachrome, but I suspected from first glimpse that it was somewhere on the Okanogan River. I am getting better with the Googlecopter. The first time I searched the river for this subject I did not find it. This time I started at the river's outflow into the Columbia River (at Brewster) and determined to follow it north for the about 70 miles to the Canadian border at about three hundred feet off the ground. I was rewarded within moments. Here about 30 miles north of Brewster the valley narrows, squeezed by rock. The bigger one of the left is an extension of Short Mountain. 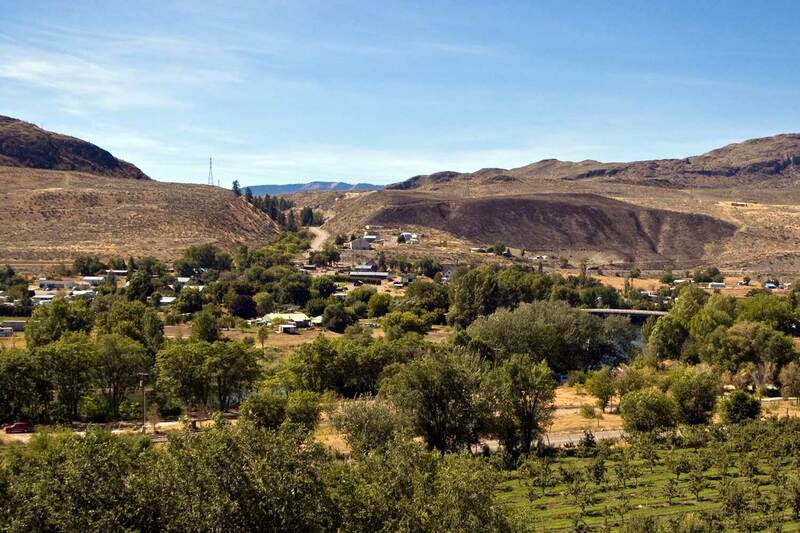 The town of Riverside is about five miles behind Sykes. It is there that the highway leaves the river and goes to the other side (west) of Short Mountain. It rejoins the river about seven miles up stream from Sykes, just south of Tonasket. In the distant horizon (about 15 miles north of Sykes) is the pointed peak of Whitestone Mountain. (Click to Enlarge.) It is unique in both its coloring and topography, reaching over 2800 feet, which is 2000 feet higher than the elevation of the river here below Sykes. Directly following this caption is a "now and then" comparison of Riverside that we made for the book "Washington Then and Now" but could not use for want of space. The "then" was photographed by Frank S. Matsura, a pioneer Washington photographer who made his home in the Okanogan Valley in 1907, and built a great photographic record of it until his death by tuberculosis in 1913. Jean took his "repeat" in 2005. 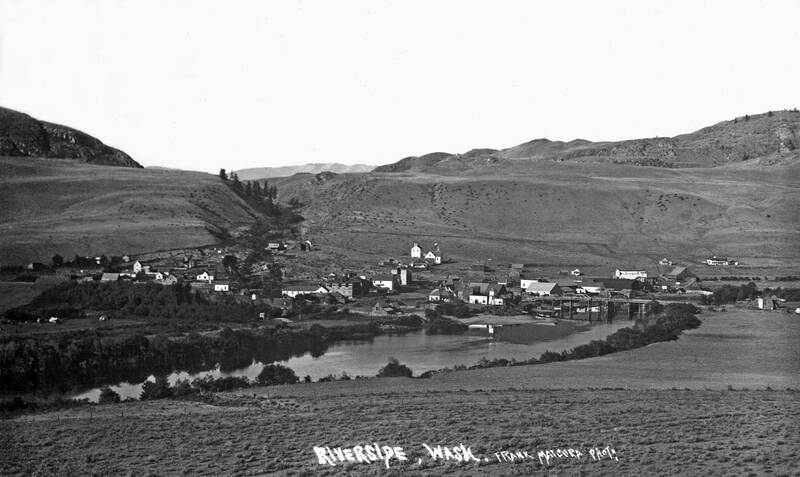 Riverside, Washington by Frank Matsura, ca.1910. Jean's repeat and homage to Matsura, recorded during the summer of 2005.